The Youth Arts Celebration is a variety revue showcasing talented local student performers (1st through 12th grades) in solo and ensemble acts of all kinds. Auditions for singers, actors, dancers, musicians, comedians, jugglers, magicians, poets, and others, are being held on Wednesday, March 6, 2019 and Monday, March 18, 2019 from 3pm-8pm at the Lyric Theatre. This annual event is spearheaded by The Lyric League to support local talented youth and to raise funds to expand The Lyric Theatre Arts & Education Programs such as professional artists master classes and residencies in area schools, The Discovery Series for Young Audiences, Lyric’s AWESOME Summer Camp and family programming. Funds for these programs will be raised through event sponsorships and ticket sales. The 3rd annual Youth Arts Celebration is proudly sponsored by The Holt Family Foundation, Macaroni Kid Stuart, Linda Weiksnar, ESQ of Crary Buchanan, Attorneys at Law, Priscilla Baldwin & John Moffitt, John Morganthaler of Cruise Planners, Victor & Joan Rivas, Randy & Linda Prange, Patty Downing, Hope Jochem, N2 Architecture & Design/Niki Norton, The Wong Family Foundation, Sailfish, Janice Binger, Elizabeth Herold, Frank & Judith Tidikis, William & Fran Slat, Pat Pendergast, Douglas & Carol Rearick, Jim & Elaine Matts, Gloria Whittle, Stephen & Aida Fry, WQCS/88.9 NPR for the Treasure Coast. 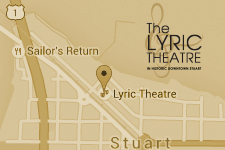 The Lyric League is an auxiliary group formed to help The Lyric Theatre with its mission of providing a home for the performing arts that entertains, educates and stimulates the growth of artistic integrity and experience for everyone. The Youth Arts Celebration was conceived and presented by The Lyric League, a newly formed auxiliary group, to help raise funds and awareness of The Lyric Theatre’s Arts & Education programs. Since its inception in 1997, The Lyric Theatre Arts & Education programs have provided Treasure Coast families with the wonderfully unique and magical experience that only live performing arts can offer. As funding for the arts continues to dwindle, The Lyric is more committed than ever to give all area students and families the opportunity to share in this cultural resource. The League will continue to help raise funds to serve our area with enrichment programs such as The Discovery Series for young adults, The Lyric’s AWESOME! Summer Camp and artist master classes and residencies.